So this style in Anthracite popped up on Bluefly.com a couple of weeks ago, and I decided to jump on it because the price was right and I have always loved the Day style. This bag is what I would call the Day's little sister. It came pretty quickly and I have to say that I'm not impressed with it at all. I guess it looks a little bit odd on my small frame. 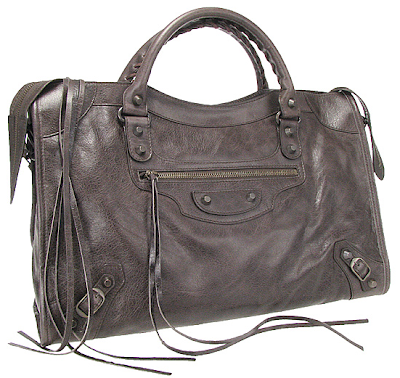 To sum it up, it is pretty much like a classic hardware Day with an extra zip pocket on the back with the famous tassels, has a very structured body, and is much shorter than the Day. 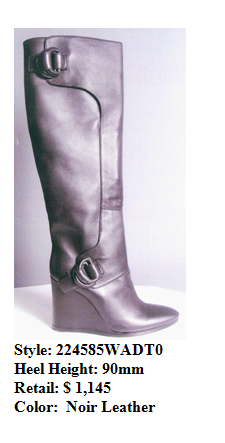 The leather is very thick and stiff, so it is a little bit different from the previous leathers. I think they could have made it much better by making the width proportionate to the length but maybe not making it as wide as the day. I think by tweaking this, it would be flattering on all body types. I'm sad to say it went back the very same day. I know others adore this style, but it just wasn't for me. This style has also been produced in Covered Giant Hardware, but not silver hardware. 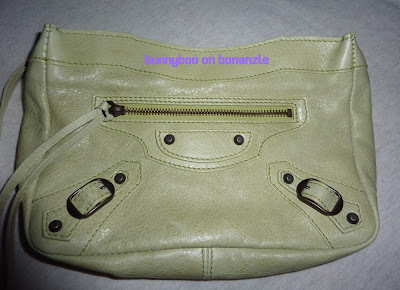 I think it looks pretty cute right here in Poupre, so maybe the giant hardware makes the bag look more proportionate? The tall mannequin makes this look like such a hot bag! A couple months back, I was able to find this baby on ebay to which the seller says it was in almost new condition. I asked for more detailed and close up photos to be sure, and made her an offer. She said she would sell it to me cheaper if I did an off ebay transaction, something that I highly don't recommend unless you do a thorough check of the seller. I agreed and paid through Paypal, and the bag arrived in 4 days. It is a lovely color, hard to describe but a yummy aqua blue that is definitely lighter than 2007's Aquamarine. It looks like this color is being repeated in the 2010 pre-spring collection, since Cyclade is very similar but maybe a tad lighter. This is my very first City! I've purchased the "First" twice and sold them both, a white one because I needed the cash and didn't want a light colored bag anymore, and a black one which I didn't really like the leather. I always thought the City would be too big for me and the double handles was a turn off. I used her on Wednesday and I have to say the City is a great style. I love that the double handles can be carried on the crook of the arm or it can even fit on the shoulder. I haven't really used the shoulder strap yet, so will have to get back on that one. I first thought this blue would be hard to pull off or difficult to match, but if you pair it with neutral colors, then it will all work out! 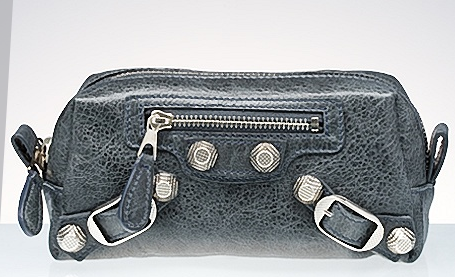 This seems like such an ideal night out bag or even a bag to take on quick errands. It reminds me of a oversized coin purse with a nice wristlet strap. 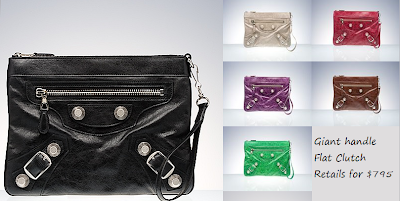 I love the giant hardware on it, its such a nice pop of "bling" on the bag. I have always thought that clutches were a huge waste of money since it's like practically paying almost as much for a regular shoulder bag. Though now I've come to realization that every gal needs an "evening" bag. I particularly like this style because it has a removable wristlet strap for extra security. Ever since losing my Dooney and Burke wallet one day at the supermarket many years ago, I'm very paranoid about my belongings. So if this is carried by hand and the strap looped on the wrist, then the chances of leaving it somewhere is slim - hopefully. 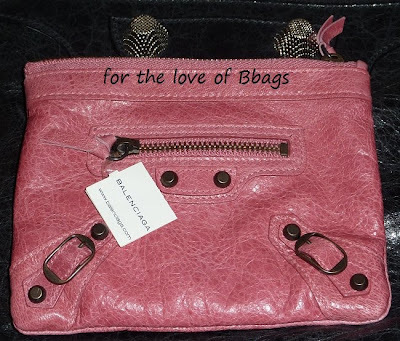 It is also a very roomy bag, though its flat, it's dimensions (11"x 8.5") are on the bigger side for clutch bags. So its nice to be able to carry a few more things if you need to, like your digital camera and wallet for example. 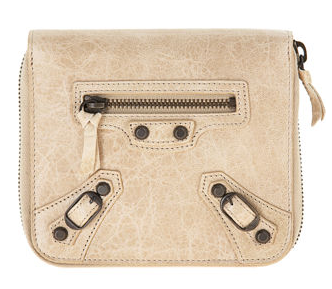 The deal breaker for buying this bag of course is seeing one on Nicole Richie! She is carrying a black one with gold hardware, such a classic combination. I've also added a picture of Heidi Montag wearing a black with Covered Giant Hardware, which looks pretty chic as well. Purchase this at Balenciaga.com for $795. This is a continuation in our farewell to the 2009 colors! 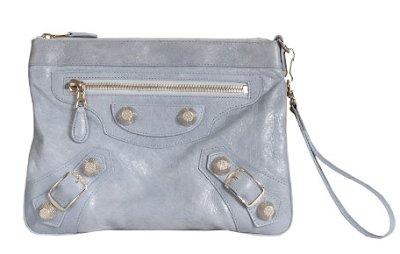 Ciel: A wonderful icy blue that is a definite reminder of 2005's Ice Blue! This color is very soft and should make a very nice neutral. Pommier: Pommier or "Palm Tree" can be most related to the coveted 2007 Vert Gazon (Kelly Green). The only difference to the two is that Vert Gazon had more yellow undertones than Pommier, but this can only be seen when you place the two together. This is a great color if you missed out on Vert Gazon the first time around. Galet: I call this color the "elephant skin", because the leather texture and color reminds me of their skin. Galet seems like a repeat of 2006 Greige, but the positive side is that this color comes in Giant hardware. This color was most popular with giant silver hardware. Raisin: This is also one of this season's most popular color. 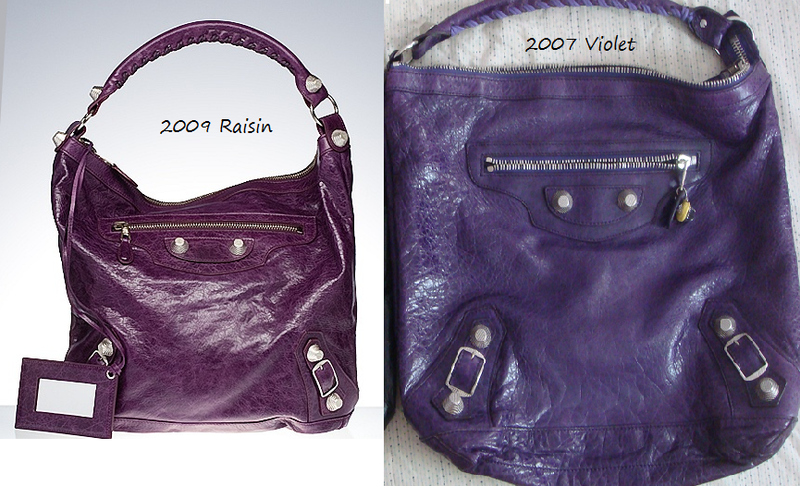 This is Balenciaga's 3rd purple in a row taking after 2007's Violet, and 2008's Sapphire. If you ask me which one Raisin is closer to, I'd give it to Violet. When I compared my friend's raisin coin purse to my Violet day they were so close in color except maybe her's had a little bit more of a red undertone. Sapphire is similar but had more of a blue undertone to it compared to Raisin. If I wasn't able to find a 2007 Violet day on ebay, I would have bought this color as a nice filler for something purple in my collection. 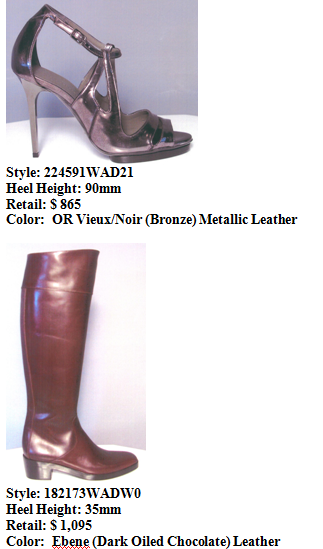 Chataigne: This color is referred to "Chestnut" on the Balenciaga website. It definitely does remind me of a chestnut that you would find at the supermarket. Chataigne looks like a rich medium brown hue. I haven't been noticing a lot of purchases for this color yet, so it might be a little bit on the less popular side for color preference. Poupre: A lot of Bal lovers were hoping this would be close to the older reds from 2005 like Rouge Theatre, but Poupre or "Pomegranate" is not quite like it. The name says it all, as the shade does look like a pomegranate fruit. Though I haven't seen it in the store yet, I would say this red has a slight pink undertone in it, but nonetheless is still a bold, vibrant red that looks splendid with silver hardware. Tempete: I have to say this stormy blue hue is one of my favorites. The closest previous color that I can link tempete to is 2007's Blue Glacier/Periwinkle. I would say that Tempete (also known as "Storm") definitely has a grayish undertone to it, kind of like the stormy gray seas. I purchased Tempete Coin Purse with silver hardware, and I have to say I'm smitten with it, color and all. Bubblegum 09: I adore this pink, and it is supposedly the repeat of Framboise, but the Bal Boutiques are calling it bubblegum 09 since there was also a bubblegum in 2005 and 2008. This pink looks nothing like 2005's light pink bubblegum, but bears similarity to 2008. I would say this year's bubblegum is a shade lighter, but still very desirable and feminine. 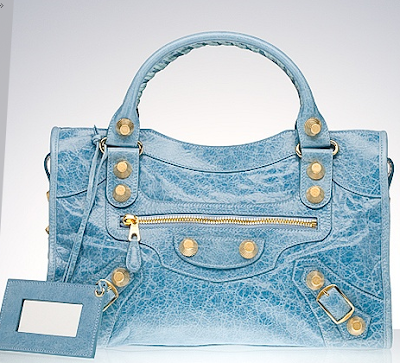 It was only sold in Balenciaga boutiques exclusively and I have not seen it anywhere else. I did purchase this in the pencil style, but ended up exchanging due to the size (too small). Overall, I would have to say Balenciaga is starting to do a lot of repeats in colors. I honestly do not blame them because there are only so many colors in the spectrum. Though these colors were not exact repeats because they were off by a shade or two, avid Balenciaga fans have taken notice and have held back on purchasing because they do not prefer repeating colors in their ever expanding collection. Granny: Granny Green is definitely like 2004's Anis, but it has also been compared to 2004 Pistachio but with a lot more yellow undertones. I had the chance to see these in real life at my local Barneys, and they looked really gorgeous sitting on the display shelf. I saw a "first" in this color and the leather was very thick and smooth. I ended buying a make up clutch in Granny, but is listed on Bonanzle because I don't need a make up clutch. Officier: A stunning dark navy blue that is very similar to 2006's ink but without the purple undertones. It has been very population choice with giant gold hardware, a stunning combination in my opinion. Maldives: I love this blue, its a baby blue but is slightly brighter. I had a Money wallet with silver hardware but ended up selling it because it was too large for my needs. Bleu Layette: Wow, Bal has been doing a lot of blues this season! This is the 3rd blue and I have to say I'm rather unimpressed by this color when I first saw it. It looked like a very muted blue. But when Bal released this color with gold hardware it was a stunning combination. I really would have loved if they made the giant day with gold hardware since the giant city is heavy for me. As we welcome in the 2010 pre-spring colors, it's time for us to bid farewell to the 2009 colors. Have I done any damage for this season? Yes! But I've only purchased small accessories. Whew, sorta..
Anthracite: Bal knows that a charcoal gray is a staple in everyone's wardrobe, so they have been releasing "anthracite" for the third year in the row. For people who prefer a bag that is not jet black, but still on the dark neutral side with a bit of "softness" to the color, then this was the "it" bag for them. This year it has been a hit where the agneau leather was nice and thick almost resembling 2007 chevre leather. Charbon: A very dark brown (almost black) that definitely is a descendant of 2007's cafe brown. It is a wonderful coffee brown neutral that has been most popular with classic hardware. Framboise: This is my most favorite color this season. It is a true reminder of 2004's rose. It is a lighter pink with coral undertones. I did have this color in a giant day with silver hardware, but ended up selling it because I thought it was too much pink on such a big bag. I did end up purchasing 2 more accessories in this color not too long ago. The leather on the framboise bags were nice, but I have to admit that the accessories were a bit on the dry side. My coin purses and the cell phone charm definitely needed some moisturizing. 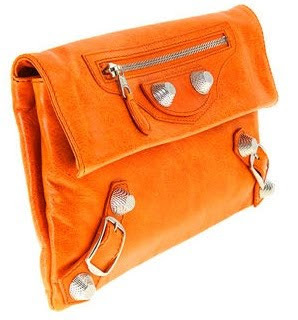 Mandarin: A really fun pop of orange that looks so adorable on a coin purse with silver hardware. Although I did not purchase anything mandarin, I wish I got a coin purse! 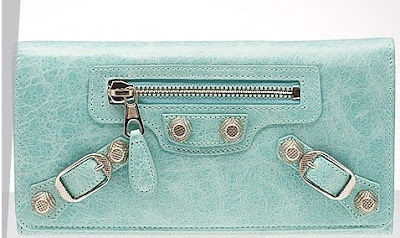 It is definitely a fun pop of color in your bag. It reminds me of orange soda! Sanguine: I did not have much interest in this color but I know others loved it! Its color is a true blood red, and it looked best with classic hardware in my opinion. This color came out beautifully on some bags but some I've noticed had a splotchy uneven dye, but it could have been just that particular bag. Automne: This hue is a beautiful rich, medium brown. 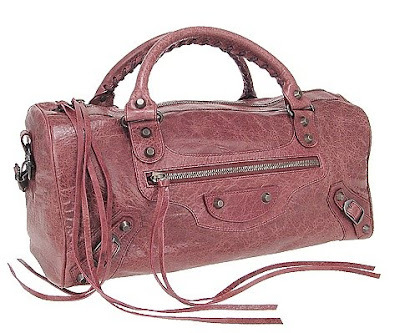 This color does achieve the vintage boho look on a bag. Praline: A very light beige that looks like french vanilla almost. I did not consider this color at all because it was too light for me because I was afraid of staining/dirtying. Well I eat those words now since I just recently purchased a ivory twiggy (which is also the banner of my blog). Here are two email updates from HGBagsOnline regarding Balenciaga stock on her website, usually the pre-owned/hard to find stuff are snapped up pretty quickly, but I thought I'd post it here anyway. Here are some pictures from my wonderful SA Sterling! 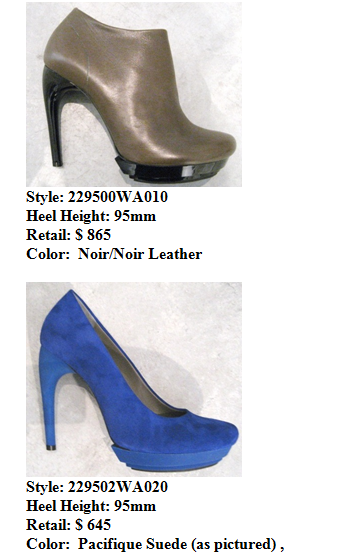 These Bal shoes are part of their sale and should be 40% off original price. Please give him a call at 919-806-3700 x1600 if you are interested. 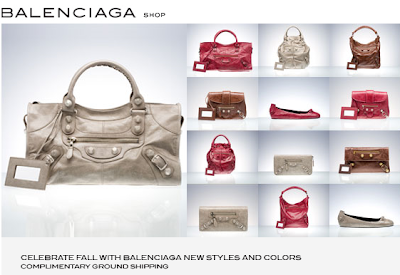 I love getting any type of email that's related to Balenciaga, so I'm going to post whatever I get onto here to share! This is from today.. discover the timeless classics, which I think they are talking about the Classic Hardware styles. Here is one from September about the Holiday Metallics with gold hardware. The styles from clock wise are money wallet, envelope clutch, giant city, and pencil pouch. I love these! 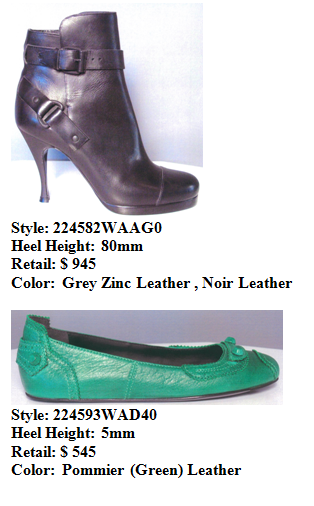 Here's an email from the introduction of the fall collection, colors include galet, poupre, and chataigne. Got this email from them this morning and they are having a Thanksgiving Sale. By popular demand, Real Deal Collection has expanded our holiday promotion. Now every Balenciaga order is eligible for a discount. Take $25 off any order under $500. Use coupon code GIVING25. Take $50 off any order between $500 and $1,000. Use coupon code GIVING50. Take $75 off any order between $1,000 and $2,000. Use coupon code GIVING75. Take $150 off any order over $2,000. Use coupon code GIVING150. Be sure to click the "Apply Coupon" button during Checkout to adjust your order total. Eligible order total excludes shipping cost. Coupons cannot be combined. For new orders placed between 11/23/09 and 11/30/09 only. 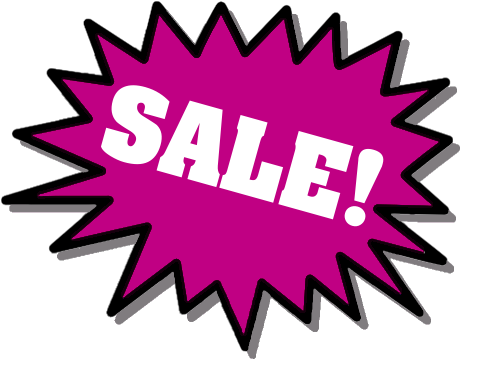 Coupon discounts cannot be retroactively applied to existing orders. These coupons expire at midnight, Mountain Standard Time on November 30th, 2009. 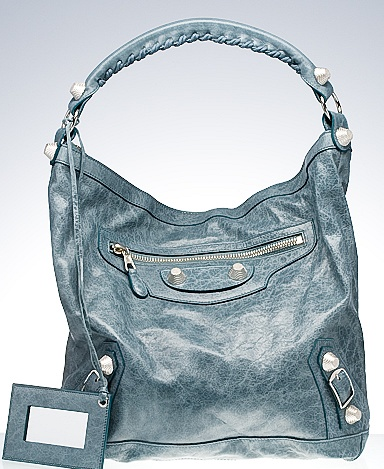 Click here to shop our selection of Balenciaga handbags and accessories. Take up 60 days to pay with our Layaway Plan. Click here to view layaway terms. 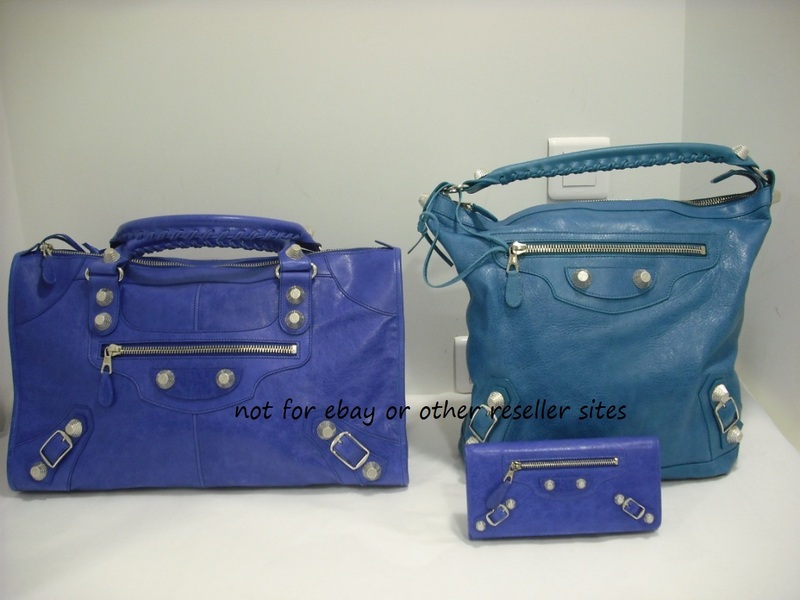 We accept trade-in bags in excellent or better, original condition. Click here to view trade-in terms. THIS PAGE IS NO LONGER UPDATED. PLEASE CHECK HERE FOR UPDATED LIST. Please bear with me as this will be a work in progress, if you have any you would like to add please leave a comment below! Thank you! Out of respect for their privacy I'm not posting personal SA emails, so if you would like it (it would say next to the store if I have one). Please leave a comment. Most of these links will take you directly to the Balenciaga handbag section, so no clicking around or searching needed. If the link is dead or has changed, please let me know by leaving a comment. Some stores sell them in-store only, so that link may just take you the front page of their site. Thanks! 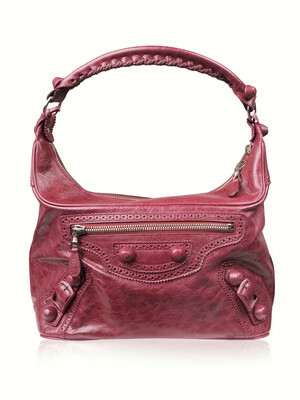 Las Vegas NV 89109 702-262-1636 BALSTR006.CityCenter@us.balenciaga.com *Thanks James! Reputable Pre-owned Stores: *These resale stores have been deemed to sell authentic pre-owned Balenciaga. If you need more information about them, feel free to leave a comment or email me (address to the right).